I never was able to go to the dentist as a child. My parents never had the money. I used to resent them for that. But, I had saved up money to go to the dentist and now I understand. This dentist told me I need a lot of work and suggested what he called a full-mouth reconstruction. This is way beyond anything I can afford. In fact, it costs more than all the cars I’ve owned put together. Is there an affordable way to get this done? How do you know if you have the best dentist for your needs? Our parent’s actions often seem more understandable as we age, however, avoiding the dentist altogether is never recommended. It will actually end up costing you more money in the long run, something your parents just may not have understood. That being said, I don’t think this is the best dentist for you to be seeing. He’s jumping a lot of guns. I don’t know if he’s doing that because he’s lazy or because he is trying to milk you for as much as he can. Either way, you want a different dentist. A full-mouth reconstruction means grinding down all of your teeth and placing dental crowns on all of them. This can only be done by the top 1-2% of dentists in the country. It takes advanced training in both restorative dentistry and aesthetics. Not many dentists have this. If it’s done incorrectly, it can completely destroy your bite, leading to severe TMJ problems. What you need instead is a dentist willing to work hard to preserve as much of your healthy teeth as he can while taking care of the issues that have further and need treatment. Affording this is easier too. You simply have the dentist list out everything that needs to be done to your teeth without wasting unnecessary structure. Ask him to list it out from most urgent to least. This way you can do what’s known as phased treatment. You work on the urgent things so you don’t end up with a dental emergency, then slowly (as you are able) get the next thing done. This blog is brought to you by Salem Dentist Dr. Randall Burba. Dentist wants to CROWN a Chipped Tooth! I fell on some ice and chipped my tooth. I wanted to repair it but my dentist said the best repair would be a crown. I know he’s not big on cosmetic dentistry, but I was hoping for something that wouldn’t grind the whole tooth. Aren’t there some cosmetic options? I’m sure your dentist is a decent general dentist and is giving you the best service he can provide for you. Unfortunately, he not the best dentist for you in this particular situation. Yes, there are cosmetic solutions to this which are much simpler. The ideal one is much more affordable than a crown too. However, I don’t recommend you force his hand on this. If he isn’t familiar and experienced in cosmetic dentistry you will not like the results you get. Many people use one dentist for their general dental work and one for their cosmetic work. 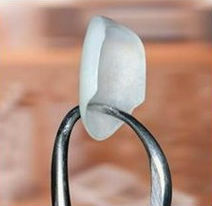 The standard repair for a chipped tooth is to have dental bonding done on it. This uses a composite resin that the dentist will sculpt onto the tooth freehand. It does require an artistic cosmetic dentist. As you don’t have one, I’m going to tell you how to find the best cosmetic dentist in your area. I mean if you’re going to do a cosmetic procedure, you may as well go to the person who can not only do it well, they do an awesome job. My suggestion is you get an AACD accredited dentist. These dentists have gone through stringent oral and written exams as well as demonstrated their artistic ability on a large number of cases. Any of them could not only fix your chipped tooth, but they could also give you a stunning smile makeover with porcelain veneers. Does Cosmetic Dentistry have to be a Fortune or a Failure? Several years ago, I had four dental crowns placed on my front teeth. I decided it was time to upgrade my smile and had a consult with my dentist. I told him I wanted something which would improve my smile but not cost a fortune. He suggested teeth whitening. I went ahead with that. The rest of my teeth look great, but the crowns now look dingy compared to the rest of them. I don’t know what went wrong, but my dentist said it was probably time to replace them anyway. When he did the temporaries, I realized that the crowns would be ugly. I didn’t want that either, it’d be no better than leaving them as is, but without the extra cost. I decided just to get a consult from one of those touted cosmetic dentists. He agreed the crowns needed to be redone, but insists I need work on eight teeth because of the width of my smile. That will be quite a pretty penny. Do I have to spend a fortune or be left with an ugly smile? You’re in a bit of a tough spot and it’s all because your family dentist didn’t know (and apparently still doesn’t) know a thing about cosmetic dentistry. He should have told you that the teeth whitening procedure you had done would bleach your teeth but have zero effect on your crowns. However, you were smart to not go through with his re-do of your crowns. His cosmetic skills are non-existent and you’re talking about your front teeth. You want the best cosmetic dentist you can find. The dentist who’s telling you that eight crowns are necessary is likely trying to give you a perfect smile. If you have a wide smile, eight porcelain veneers are common. Sometimes, even ten are necessary. However, you don’t have to have all eight done. If you’re happy with the color and shape of the two teeth adjacent to either side of your four front teeth, then you can just get four all-porcelain crowns to go with them. A great cosmetic dentist can make your smile look stunning even with those limitations. You may have to find a different cosmetic dentist than the one insisting on eight teeth. Some will only do the ideal. However, you can find incredible cosmetic dentists who will work within your desired smile. My recommendation is for you to look at two different online resources. The first is the American Academy of Cosmetic Dentistry’s website (aacd.com). The second is mynewsmile.com. Both of these will recommend the best of the best cosmetic dentists in your area. If you use the AACD site, make certain you check that you want an accredited dentist or an accredited fellow. Those are the best. My daughter has come a long way. When she was 14 she ran away. She came back this year at 19-years-old. I barely recognized her. She was too thin and completely strung out on drugs. She could barely talk. I couldn’t believe this was the same little girl who used to cuddle in my lap while I read Little House on the Praire books to her. We took her back in. She was addicted to meth but once she could communicate told us she’d do anything to get her life together and she meant it. She’s completely off drugs. She got her G.E.D. and is preparing to go to a local university. I’m super proud of her. One of the things which still embarrasses her and I’m afraid will hurt her employment opportunities is her teeth. She has what I now know as meth mouth. I want to fix her teeth so she can feel confident when she smiles. But, I understand this is a gargantuan task that requires more than your average family dentist. How do I go about finding the best dentist to give her the beautiful smile she deserves? What a great moment that must have been to get your little girl back. It reminds me of the prodigal son in the Bible. It sounds like you have good reason to be proud of the changes she’s made. None of that could have been easy for either of you. I’m sure just her coming off the meth was a torture you’d never want to experience again. It’s good that you recognize this is above the abilities of most dentists. These type of smile makeovers require immense skill and artistry. You need not just one of the best dentists. You need the best of the best. My suggestion would be to find a dentist who’s reached accreditation level with the American Academy of Cosmetic Dentistry. AACD Dentists are among the top 1% of dentists in the country. They’ll be able to give your daughter a stunning smile. It’s likely they’ll do a combination of teeth whitening, porcelain veneers, and porcelain crowns. Many of them even have a beautiful smile guarantee, so you’ll be sure to get the smile you want. I’m glad you guys are getting your daughter back. How Do I Find the Best Dentist? I’ve recently moved and need to find a new dentist. I’ve been to the same one most of my adult life so it feels weird switching. How do I find the best one available? Wouldn’t it be great if there was some independent, objective measurement to tell us who the best dentists were? Unfortunately, especially when it comes to general dental care, there isn’t. That doesn’t mean I can’t give you some guidelines to help you find the best dentist for your particular needs. The first thing to ask yourself is what type of services do you need? Are you strictly and nuts and bolts guy who just wants his teeth cleaned and maintained as necessary? Or maybe you also want some cosmetic work done? Once that’s decided, it gets a little easier. For the basics, I’d simply do an internet search for dentists in your area. Then I’d take two additional steps. You’ll want a dentist people enjoy seeing. One who makes them feel like family instead of just someone they need to get in and out of the dental chair. Reviews are generally written by those who are thrilled with the service they’ve received or hated it. Either one should give you the information you need. Each state has a requirement for how many continuing education hours a dentist has to do to keep their license. You want a dentist who not only keeps up with the developments in his field but has a passion for it. Make sure they go above and beyond what is required. They shouldn’t be offended to answer a question on how many continuing hours they do. It’s a little easier to find the best cosmetic dentist. Because there isn’t a cosmetic dentistry specialty, there used to be no way for patients to know who would give them a gorgeous smile makeover with porcelain veneers and who would give them a cosmetic horror story. Fortunately, the American Academy of Cosmetic Dentistry stepped in and created an accreditation program. This tests dentist both with written and oral exams gauging their technical knowledge. Then, it requires them to provide visual evidence of a large number of cosmetic procedures they’ve done to ensure they not only have technical skill but artistry as well. If a dentist is AACD accredited, that means you will get a stunning smile. In fact, most of them have a beautiful smile guarantee. Which Dentists Should Do Smile Makeovers? I’ve been going to the same dentist for years. He’s always been good to my family. I’ve noticed lately he’s been promoting the fact that he does smile makeovers with something called porcelain veneers. I thought that was just for cosmetic dentists. Can regular dentists do them too? I was thinking of getting one myself. You’ve brought up a very common misconception when it comes to cosmetic dentistry. There isn’t a recognized specialty to become a Cosmetic Dentist like you’d find with an oral surgeon or a pediatric dentist. A cosmetic dentist is simply a general dentist who also does cosmetic procedures. Because there’s no standard in study for that area of dentistry, you can imagine the results vary widely from dentist to dentist. So while any dentist is allowed to do a smile makeover, it doesn’t mean they should. One dentist may simply take a short seminar on how to place Lumineers and start offering that service to patients, marketing himself as Lumineers certified; while another dentist will spend years developing his artistry and skills with placing porcelain veneers investing money and time at advanced post-graduate dental training centers. When it comes to a smile makeover, you definitely want the later dentist. So, how does a patient go about finding the best dentist for their cosmetic work? Do they interview the dentist about their hours? How many hours is enough? Should they ask to see their smile gallery? Fortunately, there is an organization who’s done all that work for you. The American Academy of Cosmetic Dentistry (AACD) started an accreditation program for just this purpose. While any dentist can become a member of the AACD, it takes a great deal of technical knowledge and a demonstration of artistry on a wide variety of cosmetic cases to receive accreditation. In your place, I would simply ask your dentist if he’s AACD accredited. They’re among the top cosmetic dentists in the world. If I were paying the kind of money a great smile makeover costs, I’d want to make sure I get the most stunning smile possible. Fortunately, most expert cosmetic dentists offer a beautiful smile guarantee, so you don’t have to worry about becoming another cosmetic dentistry horror story. How Do I Find the Best Dentist to Fix a Cosmetic Tooth Disaster? Help! I spent half my savings on a smile makeover and it’s a disaster. My dentist suggested Lumineers because my teeth wouldn’t need to be shaved. I thought that would be better for my teeth. What he didn’t tell me was how bulky they’d look. I feel like I have the smile of a donkey. Plus, the color isn’t anything like I expected. They look opaque to me instead of translucent. Can this be fixed? How do I find the best dentist to fix them? These type of tragedies are way too common. A patient spends a lot of money to get a beautiful smile only to end up with a disaster that was worse than their natural teeth were to begin with. Most patients tend to leave it to their regular family dentist to do their smile makeover out of a sense of loyalty. Unfortunately, unless your family dentist has invested extensive time and training in developing their technique and artistry for creating gorgeous smiles with porcelain veneers, the results are rarely what you’d expect and often disappointing. Lumineers are often marketed to inexperienced cosmetic dentists as being easy to place because they’re considered “no-prep”. Well, you’ve seen what no prep can sometimes end up looking like. First, your dentist should not have permanently bonded your Lumineers on without letting you see what they looked like with a temporary try-in paste. The fact that he did and they look so unacceptable to you, you have the right to ask for a refund. Then it becomes a matter of finding the right dentist to give you a stunning smile. The easiest way is to find a cosmetic dentist who’s reached accreditation level with the American Academy of Cosmetic Dentistry (AACD). These are the best cosmetic dentists in the country. Not every area has them. However, it’s worth it to do a little traveling to get the best. There are some cosmetic clients who fly across the country to get their cosmetic work done. But, I realize not everyone is living on a celebrity’s budget. If you don’t have one at a reasonable distance, look on the mynewsmile.com website. Some dentists are in the process of reaching accreditation level and are equally skilled. This site checks out the technical and artistic skill of the dentist before allowing them to list on their site. No one can simply purchase their way to the list. How Do I Know If My Dentist Is the Best for My Smile Makeover? I’m worried I should go to a different dentist for my smile makeover. He’s a really nice man, but when I suggested I get porcelain veneers he said that crowns would be a better option. I told him I didn’t want to grind my teeth down when they’re healthy. He said he was willing to get certified to place Lumineers for me. He’s super sweet and I love that he’s willing to learn something to help me but I’m not sure I want to be his first case, especially because this will essentially wipe out my life savings. What do you think? Your gut instinct is right. It does sound like you have a very caring dentist, but he won’t be the best dentist for your smile makeover. You need someone who’s had significant training and skill in cosmetic dental work. It takes a lot of training and artistry. It doesn’t mean you have to switch dentists altogether. Just for your smile makeover. You can still see your regular dentist for everything else. Look for a dentist in your area who is accredited with the American Academy of Cosmetic Dentistry (AACD). These are the dentists who have the skill you need to create a gorgeous smile. In fact, most of them have a beautiful smile guarantee. Now one thing to understand is your dentist won’t know the right way to care for your new smile after you finally get it. The important thing will be to make sure they don’t use anything like a prophy jet or other power jet to clean your teeth. That will remove the glaze from your porcelain veneers and they’ll quickly become ruined. He sounds like a responsible dentist. It might not be a bad idea for him to learn about how to properly care for them for your further cleanings and check-ups. I bet he’d be willing to do that, especially because he offered to get certified in Lumineers for you. By the way, tell him if he’s truly interested in learning about placing porcelain, not to waste his time with the Lumineers seminar. He’d be better off learning about true aesthetic dentistry at somewhere like LVI. Obviously, he’d probably take that better from a peer than a patient, so feel free to show him this post. Best of luck with your smile makeover. We’re moving across the country. We’ve had a fantastic dentist all of our lives. It’s sad to me that we have to leave the clinic. I’m pretty sure we’ve had the best dentist in our state. Is there an easy way to locate the best dentist in our new state? I’ll give you some tips to narrow down your dentist choices. The first thing you need to do is decide what services are important to you. For instance, if you’ll want someone who focuses only on general dental services you’ll go one route. But, if you are interested in cosmetic dental services there will be additional things to look for. I’m going to go on the assumption you’re looking for a good cosmetic dentist because those are harder to find. There is no recognized specialty for cosmetic dentistry so every cosmetic dentist is just a general dentist who offers cosmetic procedures. As with any art based skill, there are a large variety of skills among the artists. Because it’s extremely difficult for patients to know ahead of time which dentists are skilled at creating beautiful smiles and which are really bad at it, the American Academy of Cosmetic Dentistry (AACD) developed an accreditation program. Those cosmetic dentists which reach accreditation are among the most skilled, artistic dentists in the world. If getting a smile makeover is important to you, you’ll want an AACD accredited dentist. Now, you likely fell in love with your dentist because of his personality. He showed interest and care about your family. It won’t do you any good if your dentist is artistic, but a total jerk. So, once you’ve found an AACD accredited dentist in your area, look at their smile gallery to be certain you like the results they get. You’ll also want to make sure they have some form of beautiful smile guarantee. Then, go onto sites like Google Review or Yelp! and read reviews patients have given them. You want to make sure they’re good with patients. If you take these steps, you’re very likely to find at least one of the best dentists in your new area. If cosmetic work isn’t important to you, then just look at reviews to make sure they’re friendly and do work that holds up. Who’s the Best Dentist for a Recovering Bulimic? I’ve struggled with bulimia for years and am finally on the road to recovery. It’s been hard but I’m doing much better recently. One of the things I’m doing is trying to repair some of the damage my purging has caused. My teeth are in bad shape and I caused it. I need to find the right type of dentist for this. I don’t want one who’s going to make me feel any worse than I already do. Wow! You’re a strong woman. I’m proud of the dynamic recovery you’ve made thus far. I appreciate the steps you’re trying to take. You’re also wise to try to find the best type of dentist for this situation. You’ll want to work with an expert cosmetic dentist. They have the experience in working with bulimic patients. Plus, you’ll be certain whatever work they do will be beautiful. The last thing you need at this stage of your recovery is shoddy work which makes you feel worse about yourself. The dentist will want to look at the damage to the back of your teeth. Your purging causes a lot of acid to attack the back of your teeth. It may be that will cause you to need some all-porcelain crowns, but don’t worry. A good cosmetic dentist will make them stunning. Your best bet is to get an accredited dentist with the American Academy of Cosmetic Dentistry (AACD). They’re the top cosmetic dentists in the country and will give you a smile you will be unbelievably proud to share with people.